Fr. 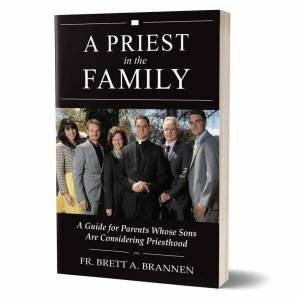 Brett Brannen’s groundbreaking book on discerning a vocation to the diocesan priesthood. 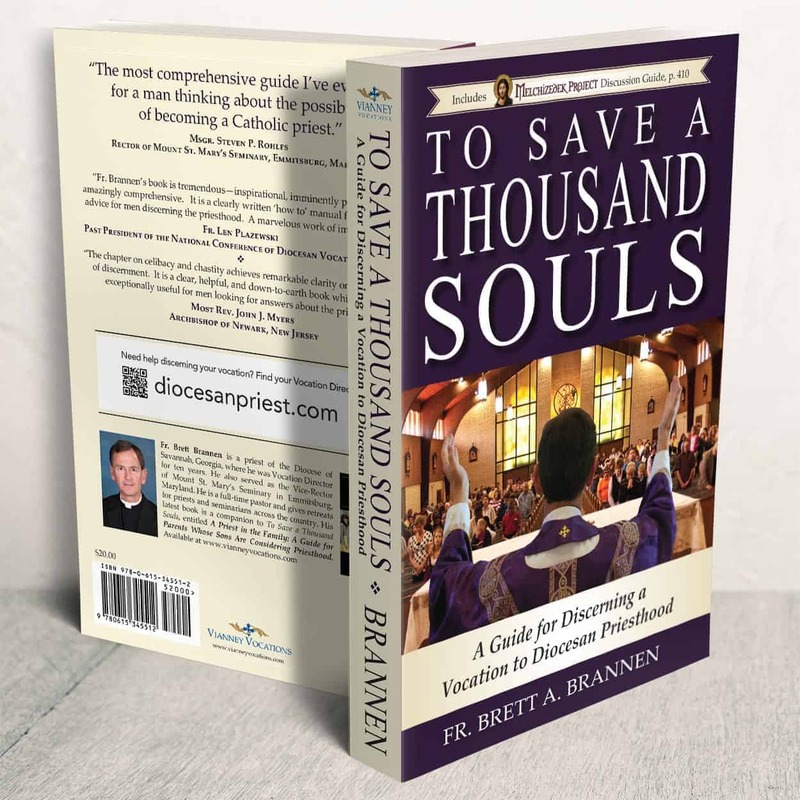 To Save a Thousand Souls has been bulk-ordered by over 100 U.S. dioceses, and has become the standard “catechism for discernment” throughout the country. It has been translated into Spanish, French, and Romanian, and re-printed in Mexico, Europe, and Asia. – Fr. Benedict J. Groeschel, C.F.R. Fr. Brett Brannen served for five years as the vice-rector of Mount St. Mary’s Seminary in Emmitsburg, MD. He is widely known as a powerful speaker and an expert in priestly formation. Fr. Brannen was ordained in 1991 for the Diocese of Savannah, Georgia, and served as Vocation Director beginning in 1993. During his tenure, the number of seminarians dramatically expanded from 5 to 28 men. By 2007, Savannah caught the attention of the national press as it ordained the second-highest number of priests per capita of any diocese in the country. Fr. Brannen has given over 70 parish missions and retreats to seminarians, priests, and religious orders. He has appeared on EWTN, published several booklets on the priesthood, and released an audio series on how to discern a priestly vocation. Fr. Brannen’s book, To Save a Thousand Souls, combines a lifetime of spiritual insight with practical advice and riveting storytelling. It is widely hailed as the most comprehensive resource available for men discerning a vocation to diocesan priesthood. His new book, A Priest in the Family, helps to quell parents’ concerns about their son’s vocation. For a man thinking about the priesthood, there are dozens of websites and pamphlets available on the subject. But until recently, there has not been a single, comprehensive guide to answer deeper questions and offer clear-cut guidance. To Save A Thousand Souls, published in 2009, is a 400-page book that provides the answers commonly asked by men discerning the priesthood. The book, written by Fr. 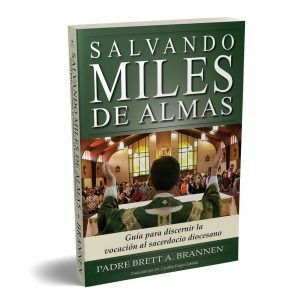 Brett Brannen of the Diocese of Savannah, has been called the most comprehensive guide ever written for men praying through their vocation. Much of the book contains stories—many from the author’s personal experience—that elucidate important aspects of discerning a priestly vocation. Many reviewers have commented that it manages to convey important concepts without use of heavy theological language. 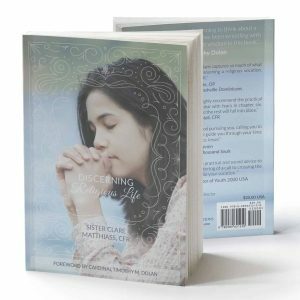 “I enjoyed the book’s conversational style and anecdotal stories, and was especially impressed by the chapter on celibacy and chastity,” said Archbishop John Myers of Newark, NJ. Before To Save a Thousand Souls, no comprehensive guide was available for men discerning a vocation to diocesan priesthood. “It’s the best book-length treatment of discerning a priestly vocation I’ve seen,” said Bishop William Lori of Bridgeport, CT. The subtitle says it best: A Guide for Discerning a Vocation to Diocesan Priesthood. Does God want me to become a priest? How can I be sure? How do I know if I have the gifts and abilities to be a priest? How do I know if I am holy enough? How do I know that I will be happy and fulfilled? If you are asking yourself these questions, this book was written for you. Excerpt from Chapter 1—What Do Priests Do? The couple spoke to me as they were leaving the Saturday Vigil Mass. They were a lovely couple and their twelve-year-old son was with them. He said excitedly, “Father, we’re going to get a hamburger at my favorite place and then we’re going bowling tonight!” This couple had tried to have children for many years and they spent a lot of money going to different specialists. Excerpt from Chapter 3—What Is a Vocation in the First Place? I once heard a priest tell his vocation story: “I grew up in a very close, devout Catholic family with loving parents and we prayed together as a family every day… everything in my life revolved around the Church. Everyone would say the same thing, “You will be a priest when you grow up. Won’t you?”… I got tired of people urging the priesthood on me, because I did not especially want to become a priest. A man in his late thirties was discerning priesthood in a certain diocese. The man had been engaged to be married twice, but both times, the man (not the woman) had broken off the engagement in the months closely preceding the wedding. His pastor suggested that maybe the reason he was not peaceful about marriage was because he was called to priesthood. So he discerned with his vocation director. My first memorable Jesus Experience happened in eighth grade. Our pastor took five altar boys to spend the weekend at the Monastery of the Holy Spirit, a Trappist Monastery in Conyers, Georgia. I did not really want to go. I would have preferred to stay home and play with my friends. But my mother informed my brother and me that we were going! Excerpt from Chapter 12—How Do I Tell My Parents I want to be a Priest? No man has ever been ordained a priest having already achieved perfect sexual integration. However, a man must be able to demonstrate that he can live chastely for a significant period of time. But what exactly does this mean? I will answer this question by giving five examples. Excerpt from Chapter 14 – My Path to Priesthood: When Do I Start? The short answer is now. Even if you are much too young to go to a seminary or if you are just beginning your discernment, make contact now. Send him an e-mail and tell him who you are and where you are in the stages of discernment. There is one Sunday morning that I will never forget for the rest of my life. It is the Sunday morning that I woke up the day after being ordained a Catholic priest.